*A good helper to keep your pets nails short,reducing the problems incurred from long nails such as dirt build up or splintered/fractured nails. *Providing safe cutting of your pets nails at home,suitable for your lovely pet cat,dog,etc. 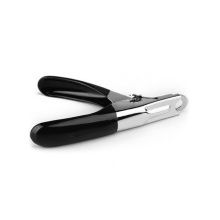 *Pet nail clipper with strong stainless steel&plastic,sturdy performance and for long time service time. *It can prevent your pets&apos; pain caused by long nails,at the same time,it can avoid the long nail from scratching the sofa or home furniture. *Two colors optional:black and red.